Bring the whole family to bowling alleys in New York for a fun time! Whether you are someone with your own shoes and bowling ball who plays seriously, or just someone who enjoys testing your skills, you'll enjoy spending an afternoon or evening in one of the centers for bowling NY can offer! This Great NY Bowling Alley Has Family Specials! 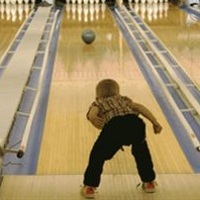 You and your family can have a blast when you go to Maple Lanes to bowl. 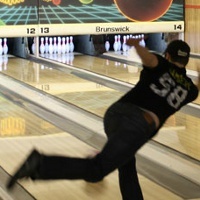 Regular specials make bowling a fun and affordable experience for all. Sunday evening bowling is just $1 per game! Check out the after school specials on weekday evenings or try out cosmic bowling with glow in the dark lanes and balls on Friday and Saturday nights. For a break stop in the Maple Lanes Cafe and choose from their wide range of food, drinks and snacks offered. 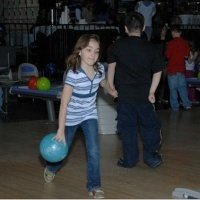 This great New York bowling alley offers Family Fun Packs with special deals for family bowling. Bowl, Snack or have a Party! If you're looking for a great place to go bowling in New York then you won't want to pass up Shell Lanes! With 32 bowling lanes, a snack counter and a bar, this bowling alley is fun for the whole family. Join a league and bowl seriously or go for fun during open bowling time. Regular specials and discounts make bowling throughout the week extra fun. This bowling alley is also a great place to have a child's birthday party - kids will have a blast bowling on teams and testing their skills while the rest of the party can take place in Shell Lanes' private party room! 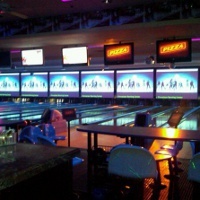 Bowl, Game and Eat at this NY Bowling Alley! When you take your family to 300 New York everyone will have a wonderful time at this alley which has it all. 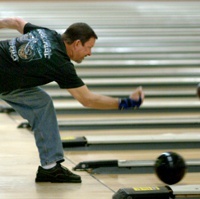 People of all ages will have a blast trying their hand at throwing strikes and spares. The 300 Grill onsite means you don't have to leave when you get hungry, just pause for a meal and then continue playing! When you need a break from the lanes stop by the fun arcade which offers over 30 games of all types. From music games such as DDR and Guitar Hero to redemption games like Deal or No Deal and The Giant Claw, there's something here for everyone! 300 New York is open 7 days a week. Enjoy the fun community atmosphere and low prices of this bowling alley. A great place to take the kids for an afternoon of fun, this alley has regular specials and free shoe rentals. With 48 lanes to bowl you'll never have to wait for a spot! Be sure to consider Gun Post Lanes for your child's next bowling party which includes special party pricing, food and drinks! A pro shop provides gear for more serious bowlers while the cafe offers delicious pizza and food for when you want a break from the lanes. Open 7 days a week, Gun Post Lanes has daily specials. Whether you are just learning or are a pro looking for a league, Bowlerland is be a great place to spend an afternoon or evening of recreation. Low prices and free shoe rentals are just a couple of the reasons this is a great place to take the family. Stop by the cafe between games for some snacks and a drink. 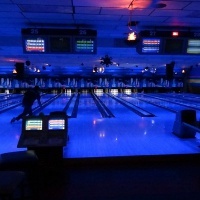 Visit on Cosmic Bowling night for an extra cool way to play - with black lights and glow in the dark bowling balls, it will be an unforgettable experience. The on-site Pro Shop means you don't have to go far to get all the bowling accessories you'd like to make up your own bowling kit. One of the Hottest Bowling Alleys Around! When you think of bowling alleys do you think of fun? Birthday parties? Arcade games? Delicious snacks? Well Showplace Entertainment Center has it all! People of all ages love bowling and this bowling alley in New York will appeal to your whole family. When taking a break from bowling, kids can have fun in the arcade winning prizes and racking up high scores, while adults can hang out in the sports bar and check out the game. This fun bowling alley is also a great place for a birthday party - girls and boys of all ages love bowling parties, so book your child's today! This NY Bowling Alley has it All! If you want to find a fun, clean place to go bowling with your family in Staten Island you'll want to visit Rab's Country Lanes. This premier bowling facility offers 48 bowling lanes, cosmic bowling nights, a high roller lounge with pool tables and DJs, a snack bar and a pro shop. Bring the family for a day of fun or have your child's next birthday party here! Cosmic bowling is offered very late on Friday and Saturday nights - teens and adults are sure to enjoy this cool approach to bowling. For the adults karaoke nights are Monday, Friday and Saturday in the high roller's lounge. Bowling Packages and Specials for All! This great bowling alley offers 35 lanes of fun for everyone from kids to adults. Bring the whole family for a few hours of bowling and dinner at the Laneside Grill. You will create lasting memories with your family when you spend time playing games with them at AMF 34th Avenue Lanes. Ask about the AMF Fun Pack where you can get bowling, shoe rental and snacks all for one price! Adults will enjoy hanging out at the sports bar where they can take a break from bowling and watch the game. Special offers for after-midnight bowlers make this place extra fun for teens and adults. 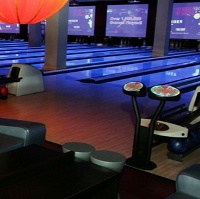 Located in the heart of Queens, this state of the art bowling alley has every amenity. From the fun arcade for the kids, to the sports lounge for the adults, a restaurant with varied cuisine, 28 lanes of bowling and a pro sop for equipment repairs, sales and lessons, there's not much more one could want in a bowling alley. With special rates for children under 16 this is a great place to bring the family for a fun time of bowling or for a kids party. Cosmic bowling Friday and Saturday nights are fun especially for teens. The Astoria Bowl restaurant offers a wide range of foods from pizza to paninis, roast chicken to hero sandwiches, they have something for every palate. Spend an afternoon or evening testing your skills at Astoria Bowl. Bowl, Snack and Have Fun! Deer Park Lanes has everything it takes to make a great bowling alley - low prices, many lanes, a bar, cafe and great atmosphere. This bright bowling alley is a great place to bring kids for a day of fun bowling or for a birthday party. Party packages come in several types at Deer Park Lanes and there's certain to be something that will work for you. 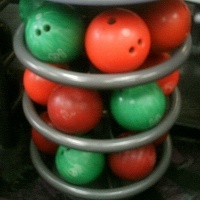 Special packages make bowling in groups even easier - ask about the food, drink and bowl packages. Fun events and karaoke nights in the bar every Saturday make it a fun hang out for adults. 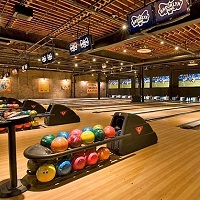 This bowling alley located in the heart of the city has everything that makes a great bowling alley and more. 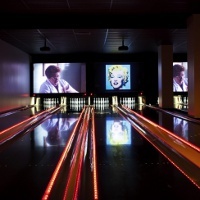 50 bowling lanes in 7 different themed lounges make bowling both an experience and a game. Each bowling area represents a different period in NYC history and is uniquely decorated. 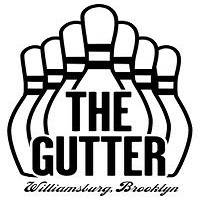 Bring the family or some friends for open bowling time or reserve some lanes for a private party. The Stadium Grill Spors Bar & Restaurant can provide food of all types whether it's for a snack between games or to cater for your event. Family Bowling Fun in Rochester! 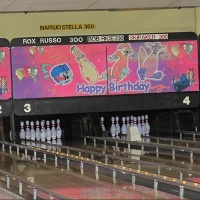 For 50 years Bowl-A-Roll has delighted upstate NY families with its 32 lanes and family friendly atmosphere. This fun bowling center has Wi-Fi, a lounge and restaurant, cosmic bowling and fun special packages throughout the week. Visit their website for special coupons! A great place for your child's next party, Bowl-A-Roll has birthday party packages where they will provide everything you need for a super fun party, from goody bags and food to a special gift. This fun family bowling center is open seven days a week year round. Bowling, Arcade, Laser Tag, Grill and Non-stop Fun! If you'd like a place you can bring the kids for a whole afternoon or evening of non-stop fun, consider Bowlwinkles the answer. Bowling is fun for all ages whether you are a pro or just beginning join friends or your family in trying to get strikes and spares at this great NY bowling alley. Laser tag and an arcade keep the kids busy whenever they need a break from bowling while the adults can head to the on-site bar for a drink and some relaxation. The grill is a delicious place to get a snack or have a meal before or after bowling. 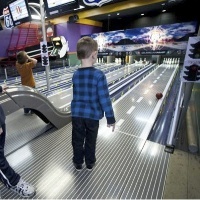 There's so much to do at this bowling and family entertainment center you won't want to leave! Classy Bowling in the City! 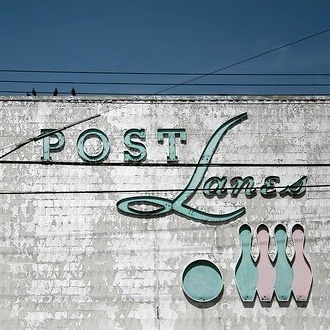 This classy bowling alley can be found in the heart of one of the greatest cities in the world. With 26 lanes for bowling as well as 11 billiard tables for those who wish to try their hand at a different game, there's plenty here to keep visitors busy. Bring the family during open bowling in the afternoons or evenings, or go with friends to one of their frequent special events in the lounge. If you're having a private party, see about renting the Luxe Lounge, with it's 4 private lanes, full service bar and private DJ station it's the perfect place for a cool teen party or adult event. If you're looking for a fun, friendly and family oriented bowling alley in NY you will find it at San Dee Lanes. 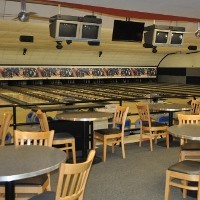 This family owned bowling alley has synthetic lanes and state of the art scoring systems for your bowling experience. A full bar with tap beer caters to the older crowd, while kids will enjoy the fun snacks and finger food offered at this fun alley. Bowl some games, relax and eat at San Dee Lanes. If you'd like to throw a birthday party, ask about the special package which includes bowling, food, paper goods, invitations and even the cake! For some of the best bowling experiences, come to Frames Bowling Lounge. 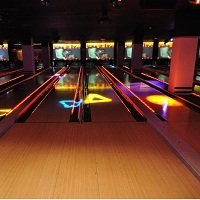 This bowling alley in NY offers a modern and luxurious atmosphere and it is the ultimate in nightlife and bowling entertainment. Frames features a bowling lounge with 28 bowling lanes, private party lounges, full-service bar, a billiards lounge, interactive media games, and one of the best dance clubs in the city that will keep you going late into the night. Frames is the perfect spot for after-work drinks, corporate events, and private parties. VIP area is for those who want ultimate luxury coupled with privacy. Frames is open daily: Monday to Wednesday: 12pm - 12am, Thursday: 12pm - 1am, Friday: 12pm - 3am, Saturday: 11am - 3am, Sunday: 11am - 11pm. Call or visit the website to make a reservation and get more information. Break your daily routine and come to get your dose of fun at Brooklyn Bowl in NY. This bowling alley has been named by Rolling Stone as “One of the most incredible places on earth”. 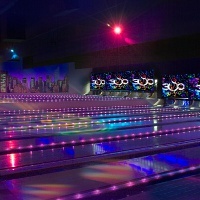 The facility features 16 Qubica AMF bowling lanes with an automatic scoring system and a bowler’s lounge with eight huge high-definition projection screens over the pins. Brooklyn Bowl has been the first L.E.E.D. certified bowling alley in the world. Brooklyn Bowl offers great drinks and food by Blue Ribbon. It is open daily: Monday – Friday: 6:00 pm, Saturday and Sunday :: family bowl from noon – 6:00 pm (all ages), after 6:00 pm 21+. Visit the website to check for specials and to get more information. Spend pleasant moments with your friends and family at Whitestone Lanes, NY. This bowling alley is open 24 hours a day, seven days a week. It is one of the few places where you can bowl all day. The facility offers space for many types of gatherings, such as kids and teenage birthdays, corporate events, private events, etc. 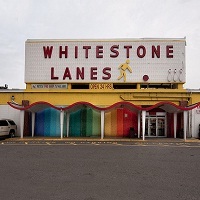 Whitestone Lanes features a Pro Shop where you can find everything you need for bowling. You can also have your bowling balls custom-drilled at it. The facility offers many specials: Monday and Tuesday night “All you can ball” for $19.5/person, Saturday and Sunday morning “All you can ball” for $19, and VIP bowling club (includes free shoe rental, $12/person/month, $5/game at night and weekends, $3/game during day, and 15% off at the pro shop). For more information, visit the website. 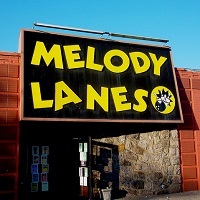 Relieve the everyday stress by spending a relaxing and pleasurable afternoon at Melody Lanes. 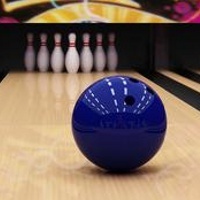 Bring your friends and enjoy the game of bowling in a friendly and casual atmosphere. At this bowling alley in NY you can also play league bowling to improve your game skills and have tons of fun at the same time. The bowling alley’s Pro Shop provides its customers with all the equipment they need to improve their game. If you get hungry, you can savor delicious and reasonably priced meals at the Snack Counter. Plan your next family celebration or a business party at Melody Lanes and make use of the great bowling and game facilities it offers. Working hours: From Monday to Thursday 9:00am – 12:00am, Friday and Saturday 9:00am – 3:00, Sunday 9:00am – 12:00am.